A letter of correspondence from Colonel William E. Todd to Dr. Cal Fowler (1929-2013) dated December 4, 1961. In the letter, col. Todd invites Dr. Fowler, the former chief activation engineer, to attend ceremonies marking the completion of the U.S. Air Force's first Intercontinental Ballistic Missile Wing at Francis E. Warren Air Force Base near Cheyenne, Wyoming. The ceremony was held at the 566th Strategic Missile Squadron Complex 11 in Nunn, Colorado. 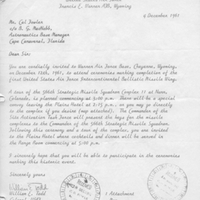 Original 1-page letter and map from Colonel William E. Todd to Dr. Calvin D. Fowler, December 4, 1961: Private Collection of Dr. Calvin D. Fowler. Digital reproduction of original 1-page letter and map from Colonel William E. Todd to Dr. Calvin D. Fowler, December 4, 1961. Originally created by William E. Todd and owned by Dr. Calvin D. Fowler. Todd, William E.. “Letter from Colonel William E. Todd to Dr. Cal Fowler (December 4, 1961).” RICHES of Central Florida accessed April 21, 2019, https://richesmi.cah.ucf.edu/omeka/items/show/6403.